Two people have been arrested and charged in connection with an attempted robbery and subsequent shooting that injured multiple people at a birthday party. 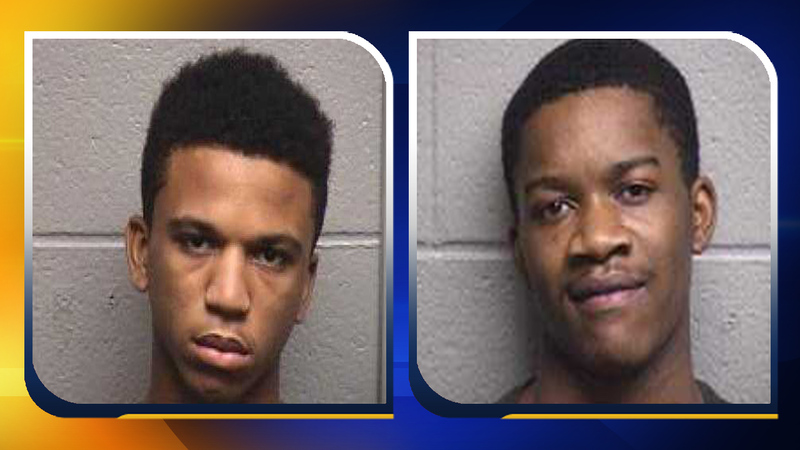 DURHAM, N.C. (WTVD) -- Two people have been arrested and charged in connection with an attempted robbery and subsequent shooting that injured multiple people at a birthday party at a Durham apartment complex Saturday evening. Ledarius Samuel, 20, and Antoine Page, 17 were both arrested in connection with the crime. Officers were dispatched after receiving a call that multiple people were shot at a birthday party outside Valley Terrance Apartments on Chapel Hill Road. Neighbors described a chaotic scene as authorities rushed the three people to the hospital with non-life threatening injuries. Marie Herrera and her sister had just arrived home from their own birthday celebration when they heard the gunshots. "We were just shaken up," she said. "It's the first time it's happened right outside our door." Police are not sure if the suspects knew the party guests. At some point, investigators say the 17-year-old suspect was shot. They do not believe he was shot from someone at the party. Samuel was charged with robbery with a deadly weapon, conspiracy to commit robbery with a deadly weapon and possession of a firearm by a felon. He was placed in the Durham County jail under a $1.5 million bond. Page was charged with robbery with a deadly weapon and conspiracy to commit robbery with a deadly weapon. He was placed in the Durham County jail under a $1 million bond. That shooting was just one of several that made for a violent weekend in Durham. Sunday morning, a man was found shot to death off Guess Road. Saturday afternoon a man and woman were shot off Liberty Street. Police do not believe the shootings are connected. Despite the rash of shootings, Durham police say the number of people shot in the Bull City is down 26 percent since last year.